Location: Located on the corner of The Highway and Rectory Lane, and adjoining the S side of Kentigern. Single-storey flat-roofed brick building with symmetrical shop facade. Castellated parapet with coped crenellations, the central one stepped-up. 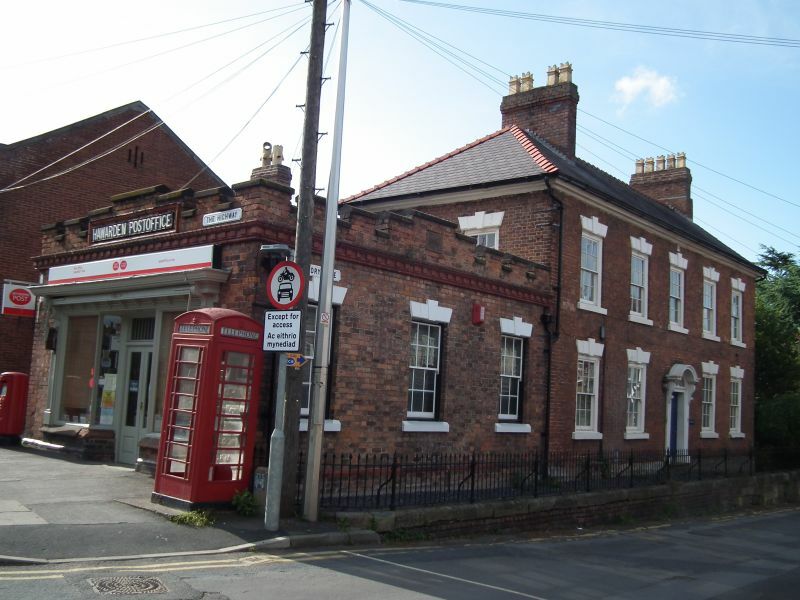 Beneath this a rectangular moulded frame containing incised name "Hawarden Post Office." On E parapet, the date 1907. Moulded and dentilated cornice. Wooden flagpole and contemporary blind-box. Central entrance with recessed double doors. Glazed upper panels. Moulded brick plinth and stone cills. Included for group value as a well mannered building with Kentigern and other items in the village centre. At the crossroads in the centre of the village: set on the pavement outside Hawarden Post Office, and on the corner with Rectory Lane. Standing prominently at the junction of The Highway and the A550. Standing prominently on the street-line, opposite the castle entrance gates.